The Rumble Bs took the track on Saturday evening with a 1-1 record, looking to bring home their first home W of 2012. It was going to be a tough game, with about half of Madison’s roster playing in both the A and the B games. The Rumble Bs got off to a quick lead with Trouble MakeHer capitalizing on a power jam early on. 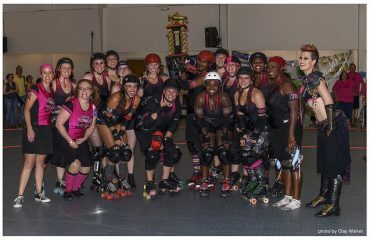 However, back-to-back penalties on the Atlanta jammer brought the Unicorns right back into the game, and then into the lead! After a strategic time-out to regroup, Atlanta steadily climbed back into the lead and was ahead at halftime, 81-58. The second half continued with some brutal blocking by Tina Tourniquet and Ozzie Kamakazi. (This was Ozzie’s last game as a Rumble B, the next time you see her she’ll be in the baby blue and red of DSDG!) Unicorn blockers Stank Girl and Splatter Alice did their best to hold back the Bs but were no match for jammers ChokeCherry and Emma Wantsome. Madison kept the game tight and exciting, but the strong Bee-fense held back the Unicorns long enough for a stinging ending. The Rumble Bs improved their record to 2-1 and earned some hometown fans with a 142-111 victory over Team Unicorn. Players of the Game were Trouble MakeHer for Atlanta and Splatter Alice for Madison.